The ethanol story – and solution – every American must see. Declare your independence from oil. 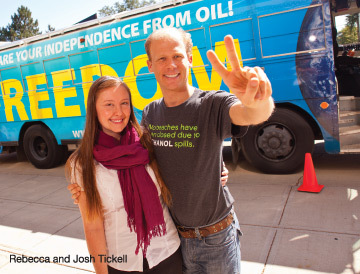 That’s the motto Josh and Rebecca Tickell are hoping people will take away with them after watching FREEDOM, the documentary they co-directed and produced. The film tells the story of the biofuels backlash and shows who paid for the lies behind the arguments. It gives hope as it explains how the United States can get off oil. FREEDOM is more than a movie. It’s a tool to educate and inform the masses about the homegrown solution we have right here to solve the oil problem: ethanol. That message is being shared on a 45-city tour across the nation. After interviewing Rebecca, FREEDOM could also be described as one more thing – a wakeup call. [Vital] At what point did you know that you were definitely going to be making this film? Rebecca Tickell: After the oil spill we were really down. I was sick, and we were really frustrated after what we had witnessed in the Gulf – how our government and “we the people” were failing to protect the environment and get off oil. So we started by educating ourselves on what we could actually do. We started talking to people… and people started talking to us about ethanol. Our minds were open and we realized we had been wrong about ethanol. That’s when we knew we were going to make a film about it. Because the more we learned, the more we uncovered and the more we became aware that we all have been completely mislead and misinformed. There is so much promise with ethanol. We finally saw hope that came in the form of what we have available right now, today, with ethanol. When you wake up to it and really realize what the conversation is about –we couldn’t help but make a movie about it. We couldn’t not get a bus and go on tour to spread the message. It’s that important. Can you describe the bus and all that it entails? R. Tickell: It’s a sustainable bus. It has 19 solar panels on it. It has an 8.1 liter GM workhorse engine that’s been modified to run on E85. Inside the bus there are interactive displays on wind, solar and water. It’s all eco-friendly and energy efficient. We are running the bus on very little power and we talk a lot about how much energy each thing is using. It’s a remarkably small amount. The floors are recycled tires. Everything in it is recycled and repurposed. It’s the perfect example of what we call an “ecology of solutions.” All of the alternatives that we have available to us right now are working together to create sustainability. Ethanol is what is hauling it down the road – that’s the most important part when it comes to freedom from foreign oil. From city to city, what does the “average Joe” with very little knowledge of ethanol think about the bus? R. Tickell: Well, we’re driving around inside this giant billboard. You can’t miss the bus. It’s bright and we’ve got the bullhorn on the top. We’re making announcements wherever we go and getting attention. People love the bus because it’s this big bright shiny thing that’s talking to you. People come on the bus and they are shocked at how cool it is inside. It’s educational, but it’s also really cool. It’s a museum and a mobile laboratory where we can start talking to people about the issues. Every conversation that happens on the bus is one where people are getting educated. How does a typical tour day start? R. Tickell: First, we create how the day is going to go. We get the bus all decked out and ready for people to come on. Any given day we have anywhere between 25 – 250 people who come through the bus, sometimes more. The entire crew is interacting with people and we are all talking about ethanol…a lot. The majority of our day is about having conversations about ethanol. So our biggest preparation for our day is how we are going to interact with people in this particular location, because each place tends to have more of a “regional conversation” about ethanol. For instance, in the Midwest people are much more informed about ethanol than when we are talking to people in San Francisco, for example. In the Midwest, our conversations are about the really nitty-gritty, nuts-and-bolts details of ethanol. Also, the discussions tend to be more about what needs to happen on a political level. Where as in San Francisco or Los Angeles, some people have never even heard of ethanol before. So there’s a lot of education that’s going on all day long. We are constantly giving tours of the bus because it is an instant way to get people into a dialogue about ethanol. It’s been really great, and a bit overwhelming with how many people we are meeting every day. R. Tickell: There are five of us. Josh, myself, Boise Thomas – he’s the tour captain, Tracy Mork – she’s our First Mate, and our camera man, Tyler. You know, as much as we’re educating, we’re learning. It’s been amazing watching our whole team really undergo this epiphany all at the same time. How did you find your crew and get them on board? He is a big environmentalist and sort of a “green” celebrity. He’s been on Planet Green’s Alter Eco. Plus he’s a host and he’s done three tours across the United States. We couldn’t have found a more perfect Tour Captain. He is totally committed. He went from telling me, “I don’t know what I think about ethanol…I don’t really think that’s my thing” to shouting from the bus megaphone to as many people as will listen. What has been the overall reaction of the film and the bus? R. Tickell: People are very moved. They are inspired. They are relieved. I like that description – relieved. R. Tickell: Yeah, in the Midwest I think people are relieved because somebody is addressing the points that have been made against ethanol. There is still a stigma in people’s minds that ethanol is bad. So they are relieved when they see these negatives are getting addressed. That has been the most powerful thing about the screenings. Because finally there is a vision from people who see how we can unite around this issue, regardless of where they are from or what their political views are. R. Tickell: I think we all have to get over being complacent. It’s up to each one of us to actually take action. Watching a movie doesn’t make a difference. Putting ethanol in your car makes a difference. My dream would be that we could get a copy of “Freedom” into every Congress person’s hands. I would love to get it into Obama’s hands and into our schools. We created this movie not just in an empowering context, but as a tool. I really hope people use it. What has been the biggest showing to date? R. Tickell: The biggest showing was in Sedona, Ariz. with over 600 people. R. Tickell: We’ve had as few as a dozen people show up to one of our screenings. However, that’s not the norm. We had 450 people in Los Angeles and 250 in Watertown, S.D. On average I’d say it’s between 75 and 125 people per screening. As you’ve been on tour, what famous or interesting people have you met along the way? R. Tickell: We’ve been all over the place. Even in the process of making the movie we were on a road trip and meeting people around North America. We were with Newt Gingrich; General Wesley Clark; former CIA director, Jim Woolsey; Bud McFarlane who is the former National Security Advisor, as well as numerous Congress people and Senators in Washington, D.C. We met a lot of really powerful people in our government. In the Midwest, we met with farmers and ethanol business leaders – Jeff Broin from POET and Todd Becker from Green Plains. We went to several facilities to get an education in ethanol. I stood in mountains of corn! Then there’s Ed Begley, Jr., here in Los Angeles and his wife, Rachelle. Jason Mraz who gave us the “Freedom Song” that’s in the movie. A lot of people are familiar with his music, but in this movie you see how much he cares (note: after watching the film he vowed to give out free copies at his concerts). He had his eyes opened through this whole process too. As did Ed, as did Amy Smart, as did Michelle Rodriguez. Is there one person that you wish could see this film? R. Tickell: Considering that we have an agenda, it would be President Obama. He has the power to change this. And Steven Chu the U.S. Secretary of Energy. He has the power to change this. But I don’t want to leave people with, “Let’s wait on President Obama to do something.” Yes, I want him to see the film and I think it would make a difference. But I think, ultimately, it is each person that we come in contact with. Each person that drives by the bus and visits the website. I think every single time this message gets carried to another person it has the power to make an impact. We can start to demand a change with our purchasing power and that can shift our whole system. We don’t have to wait for Obama. What are the stories you are going to tell your grandkids about this journey? R. Tickell: Well, let’s see, we drove around the country in an old ’88 school bus and had conversations about transforming America as well as about being sustainable. Wouldn’t it be great if we could say we helped save the economy? We saved the environment. We helped stop the war that is happening in the Middle East. We got to be a part of it! It’s not just Josh and I. We’re part of a movement that the bus and the film are symbols of. All of the people who are seeing the film, whether they know anything about ethanol or they’ve been involved in the movement for 30 years, are all participating in this revolution. How lucky are we to get to be a part of it?